Discussion in 'Model S' started by RubberToe, Mar 29, 2016. I thought it would be interesting to see whether this trend continues into 2016 or not, versus 2015. So using data from both the good car bad car website, and the insideevs website, I put together the following spreadsheet. This includes the data from the original investors letter, with the 2015/1016 data further to the right. A couple things are evident from just the first two months of sales. Month to month sales can fluctuate pretty wildly. Just look at the BMW 6-Series data. I'm not inclined to try and figure out why sales dropped from 1,237 in 2015 down to 265 this year. I'm just pulling the raw numbers together to get the same idea of what is happening versus Model S sales like Tesla did in the investors letter. And note that Mercedes started combining their much lower CLS-Class sales with the higher E-Class sales. A coincidence that CLS sales were down pretty significantly in January before the February combining? I'll continue this going forward, the next update should be in about a week. If insideevs adjusts their Tesla U.S. sales estimates after Tesla releases their first quarter actual results, I'll incorporate the new numbers. Thanks for doing this. It'll be interesting to see how this year goes. Now, how about Model X compared to it's rivals? I'm guessing moderate impact this year, major impact next year. Thanks for the chart RT. Next week should be interesting. Uh oh! The others guys need to wake up and enter the new order! Personally, I find the data quite gratifying. Why do they always leave the BMW 5 series out? And March numbers are all in now. I'll start tracking these for the Model X too, and also looking at Model 3 competitors to see whether the recent unveiling will start to decrease sales of Model 3 competitors going forward. Anyone know off the top of their head what vehicles are in the Luxury SUV segment along with the Model X? Great thread, OP. Good stuff. YoY is good. All that Wall St talk about deliveries seems to be an overreaction. I got a spam link somehow, I reported the post. Just a heads up to the OP. Does TSLA round their reportable numbers, or do they intentionally cut off reporting periods at rounded numbers? No footnotes provided, so just wondering. Love the report, thank you. This is a wrong comparison. Tesla says the Model S is a "premium" not a "luxury" vehicle. Probably because they sell a boat load of 'em! 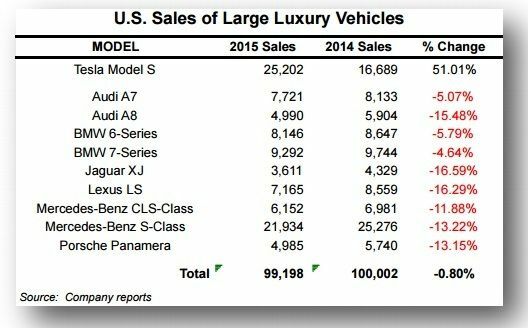 Tesla doesn't report their domestic sales numbers, so the numbers are estimated. I believe they look at new car registrations in each of the 50 states and tally them up, then round off. What's more accurate is to say this is a comparison of cars in the same price range as the Model S. The trim on the Model S is decent, but it doesn't pamper you like Mercedes and other luxury cars do in this price range. I would say it compares favorably with Buick and even Lincoln. When they can make batteries cheaper, if they brought the price of the S down about $20K, they would probably collapse the market for Cadillacs and Lincolns. Has anyone done a price comparison for the various cars on the list?